Many thanks to Dice Tutsumi and Mike Dutton for organizing this, and inviting everyone to participate. 7 1/2 x 12 5/8"
what happened to be nearby that caught my eye. 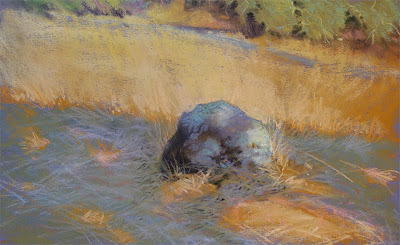 In the case of the boulder painting, I had just been informed I could not paint on some vineyard land, and had driven down the hill, and out of the gate. Once off the property, I pulled over, and hiked up a hill to see what I could salvage from the lower vantage point. The boulder and cast shadows caught my eye, and I went right to work. The embankment painting was a similar story of driving around the East Bay hills, and not finding anything inspiring me. Once again, I had pulled over, and was surveying a blown out view to the East, when I noticed the shrubbery and moss next to my car had the complexity of a persian rug. The tree made an interesting interruption of the pattern. Paintings of this nature remind me to be open about what is worth painting, and not be too stuck on a specific plan of what to expect when one goes outside. A Story Goes With It.. Complacency and comfort when painting are usually not your best friends, as urgency, fear, and other adrenaline-pumping internal mechanisms can help sharpen one's senses and force decisions. On the other hand, periodically one encounters circumstances that allow an extended period of work, without excessive shifting of color and value. One can work in an un-rushed, contemplative manner that is productive and fruitful. This image is a result of one of those (for me, infrequent) opportunities. This was painted in Sept., 2003, on the West side of Sonoma, on Felder Creek, which runs along the North side of the Grace Vineyard. 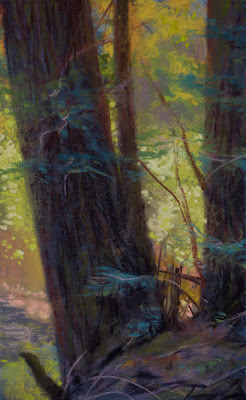 I had been painting further up the road on some private land when, on the way out, I parked here and started exploring the small creek that was mostly obscured from the road by berry vines and poison oak . It was midday, and I had already done a painting that morning, so had little sense of urgency. The qualities that made me pick this were the division of the scene into 2 worlds: the 'vast' region above the creek, and the intimate, timeless environment below. 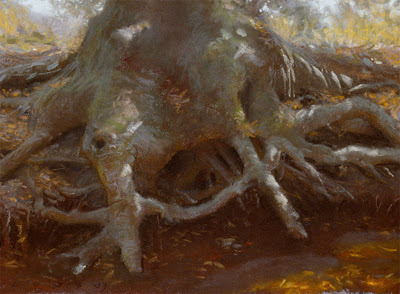 Old, exposed tree roots, slow moving water, saturated into warm red-browns, accented by yellow and orange leaves drifting lazily, or lying at the bottom of the creek. It was a fairly complex problem in terms of form and edges, and the moving dapples across the entire scene added further interest. Fun! I dropped my pack, set up my chair, made a quick thumbnail in my sketchbook, and set to work. I noticed the lower part of the tree bore the character of an elephant, the texture of the bark like wrinkled skin, and the broken, or sawed off, roots like old tusks.There was a trunk in there too...no pun intended. As it was harvest time in the vineyard above the opposite embankment, the voices of workers conversing in Spanish drifted across my field, along with the whine of a small truck rattling to and fro, the periodic emptying of crates of grapes, thumping and tumbling into a bin, though I could see not see a soul, nor could they see me, hidden in the shadows of the creek. After quite awhile, I heard leaves crackling behind me, and turned to see an older woman standing some 50 feet away. She was startled to come upon me, and apologized for her interruption, as she regularly walked her dog along the serpentine banks, encountering no one. We chatted a bit, as her dog wandered about, sniffing at my pastels. She had lived on a ranch across the road for many decades. Steelhead used to swim right up the creek from the bay, she recalled, though none had been seen in recent years. My painting progressed incrementally as the light slowly slid over my right shoulder into the West. I struggled to see color in the dapples, as my eyes were so used to the shadows that the bright splotches were more white than any color I could 'name'. Value trumped color perception. The roots were challenging in several ways. It was hard to get the dark recesses to feel dark enough....one of the curses of the pastel medium. On some root structures, I resorted to drawing a dark line to define them against the background. What had given me the courage to "put lines in nature" so to speak, was an oil by Degas I'd seen years earlier, where he'd gotten away with such a thing right down the back of a figure. Take a look at "Portrait of Hortense Valpincon as a Child". I'm sure he's done it numerous times, but that is the piece where it really struck me how much license an artist has to provoke illusions. When used sparingly, it goes relatively unnoticed, and pushes contrast where it's needed. I had been reading 'Carlson's Guide to Landscape Painting', a book, written in the 20's, that contains a lot of useful wisdom and observations about painting natural phenomena. In the voice of another century, Carlson offers up some insightful comments about edges of contrasting forms. Simply put, he states that as contrasting value masses approach each other, they each change value slightly towards the other, with the greater mass prevailing to some extent. He gives some real world examples involving tapering church steeples, and the values of the sky as seen through holes in the foliage of trees. Visually, this effect can be quite subtle, even undetectable to my eyes, and is representative of the diffusion of light, or the shadowing of atmosphere. It is a quiet but powerful effect. 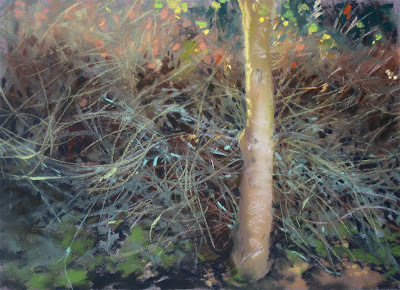 As I had reached a point in the image where I was landscaping my own painting, indicating leaves and twigs, I started to think about his advice on edges. I studied the left side of the trunk against the brighter background of the embankment turning upwards, the vineyard, and sky, but I could not discern any darkening of those lighter zones. However, it seemed the tree could possibly be lighter in value near those areas. Was it due to Carlson's ideas, or the many other circumstances that were operating? The tree was a cylinder of sorts, and it was turning towards the brighter area, away from the shadowed region of the creek. The lichen splotched bark looked bluer in that region, as perhaps the color of the sky was filtering in. I began to delicately lighten and cool that region, when suddenly, the edge of the tree seemingly disappeared. There was no edge, just a soft transition of values as the eye slid from the tree into the illuminated space beyond it. I stopped working and stared at my painting. What had happened? I'd just had some kind of a visual epiphany that had come and gone in a moment. Later on, I raved about the experience to my artist roommate for the week, Paul Kratter. He listened to me patiently, studied my pastel in silence, then turned towards me with one of those, "What the Hell are you talking about?" looks. I guess you had to have been there to have seen what it was like before. My only advice to other painters is, read what Carlson has to say about edges, try it yourself, and see what happens. You may be the only witness to the effect, but it is worth it. Quiet, but powerful.